Personal growth and fulfilment are key to dedicated, motivated employees and colleagues. So when staff become dispirited and disillusioned, there are ways managers can help them to rediscover a passion for their work, says Edward Gildea. Gerry had been keeping a low profile during the seminar and did not look as if he wanted to take part in the exercise. I took him aside and we agreed on an imaginary scale of one to ten stretching across the carpet. Ten was over by the coffee and refreshments table; one was toward the toilet; beyond that was 'suicide drop'. When your sense of self-worth drops below one on the scale, you will be feeling pretty suicidal. "Okay Gerry, on a scale of one to ten, how would you rate yourself in terms of personal success? Not your salary or promotions within the company, but your inner sense of how successful you feel." Gerry thought for a moment and moved towards the toilets. "I'm on two," he said. Gerry was in his early/ mid-50s, working in an engineering company. "I don't feel I'm doing much any more. The company don't seem interested in me. I don't contribute much. I suppose I'm just hanging on for as long as I can until my pension comes through." You could sense the demoralisation deep in him. Once a promising graduate engineer, all his expertise was being wasted. With retirement not until 65, the company would be paying out dead money for over a decade to come unless they did something about it. "So what would have to happen to move you to three?" I asked. Gerry thought for a while. "I suppose if they gave me responsibility for a young graduate apprentice engineer, so that I could support his early career and pass on some of my knowledge." "Okay, let's imagine that has happened. Move on to three. How does that feel now?" Simply the act of moving to three made a huge difference to Gerry. He felt more positive, more valued, more energised. It is often the way with visualisation exercises like this. "So now imagine that the company has given you five graduate apprentices to look after and mentor and you can see them benefiting from your knowledge and some of them are even coming out with engineering solutions you wouldn't have thought of yourself. You can see that several of them are going to be really gifted engineers. Where on our scale of one to ten are you now?" Gerry describes how much more positive and motivated he feels about his career. And he begins to walk. He is heading towards the coffee table. Finally he stops. "Where are you now?" I ask. I can hardly believe it. While he is still standing on nine and experiencing what that feels like I ask: "What are you going to do tomorrow to make that first step from two to three?" We start action planning: who he needs to see, what he will say, how he will present his case. I'm afraid I don't know what has happened to Gerry since then. But at least both he and his company had a solution they could use to address a demotivated and demoralised employee. It is a coaching technique I have used many times with teachers. How do you motivate the demotivated? There is no one-size fits-all answer. You have to ask them. And they won't necessarily know themselves unless you ask them in such a way that they feel supported, valued and listened to, so that they can take the risk of imagining and of being honest. That's all fine, I can imagine a thousand senior leaders up and down the country saying, but what about those teachers and staff who are not only demotivated but also bordering on incompetency? Or those who don't adopt a low profile but a very high profile in opposing every change agenda in the development plan? I start with the premise that everybody wants to live a worthwhile life. 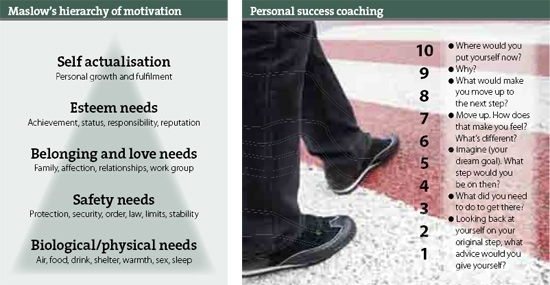 In Maslow's hierarchy of motivational needs, we are all looking for 'self-actualisation' - personal growth and fulfilment. However much we in education might grumble about pay and conditions, our lower needs on the hierarchy - food, drink and warmth, security, order and stability - are largely fulfilled. Of course, the government inspection and league table strategy has been designed to erode our feeling of job security in order to motivate us. But you would never put: "I enjoyed excellent job security" on your tombstone! Our workplace also offers us very significant social fulfilment: the rapport we enjoy with colleagues, the sense of belonging, the intrigues, the gossip, the real sense of community. When relationships go sour in the workplace, they can become a significant demotivator, so it is important to pay attention to relationships within teams, to celebrate together and enjoy the stimulus of each other's company. But ultimately what makes us really work long hours, put energy into new initiatives and take pride in our work is the fulfilment of our self-esteem and self-actualisation needs. The trouble is that when a career hits a plateau, we start to look elsewhere to build our feelings of status and self-worth: we join the golf club, work on our handicap and aspire to a place on the committee; start to direct the local amateur dramatic club; enter local politics and get called 'councillor'; plot ways of winning the pub quiz trophy...a thousand ways to exploit our talents, get noticed and help to feel that we are someone of value. As a senior leader, your aim is to get those talents re-focused to the benefit of the school or college and the students in it. First of all, think strategically: is this a competent employee who has become demotivated? Or an incompetent one? If it's the latter, plan your process of support, target-setting and movement towards formal competency procedures. There is little point trying to re-motivate someone you feel is not capable of reaching the levels of competency you require. For the competent person, however, the process of dialogue needs to start, to find out how they are feeling about their job, what their aspirations are and what they would like to achieve over the medium to long term. Few of us would deny that we are looking forward to our pensions but with few early retirement options available, we have to hang on in there. This is where coaching can play a useful part. It should be a carefully designed and established coaching process that is not just about mentoring colleagues towards better behaviour management with challenging students, but which also looks at the whole context of working and private life. The hope is that the discussions will reveal a high degree of congruence between what the organisation needs in terms of the person's contribution and what the individual is hoping to get out of his/her working life. Where there is little congruence, however, there is work to be done. The overlap needs to grow, so that the individual does find self-fulfilment at work, whether in mentoring new staff or students, launching a new diploma course or leading a field trip, and feeling genuinely appreciated for these things by the senior leadership, by colleagues and even, maybe, by the students. There may even be a role in using an 'elder statesman's' resistance to change as a form of helpful in-house devil's advocate when new systems and procedures are being designed. After all, when you've been teaching for 30 years, you have seen a lot of initiatives come and go! However, if the circles don't overlap very much and all attempts to increase the overlap fail, then there is a need for serious discussion. The person will not be feeling happy in his/her job. He/she will probably be looking for a way out. Now is the time to involve the union because you are now both looking for a win-win outcome based on a shared understanding of the difficulty of the situation. Simply reaching that shared understanding may make a difference, but equally there may soon be some instance of refusing a reasonable request which will spark off a disciplinary procedure and a deal might be struck as a result of that pressure. On a day-to-day basis, however, school and college leaders are in the business of constantly motivating staff by showing appreciation of all those significant and not so significant contributions, setting and articulating high expectations and constantly expressing appreciation when those expectations are met. It only remains for you to consider: who is satisfying your ego needs? Edward Gildea, a former headteacher, is co-leading two ASCL courses on managing challenging personnel in spring 2009.